Now, who doesn’t know about how famous India is for all the silk sarees and the varieties. From the Kanjeevarams to the Benarasi silk sarees, from Gadhwal silks to the Tussars. Lots of variety for the ladies to fall in love with! If you are in Karnataka, the silk saree variety that you have to check for is the KSIC Mysore Silk Sarees. Finest quality silk sarees with silver zari, polished in gold. Unlike the other varieties of silk saree, which are stiff and heavy, the Mysore silk saree is of the softer, easily drape-able kind. But that doesn’t mean the price range is any lesser. Due to the price of gold and silver going up all the time, the basic range of these sarees start at 14-15K. Ah, a sari post. What could be better this month that all the people in my lane are deciding to get married. 😀 Lovely! 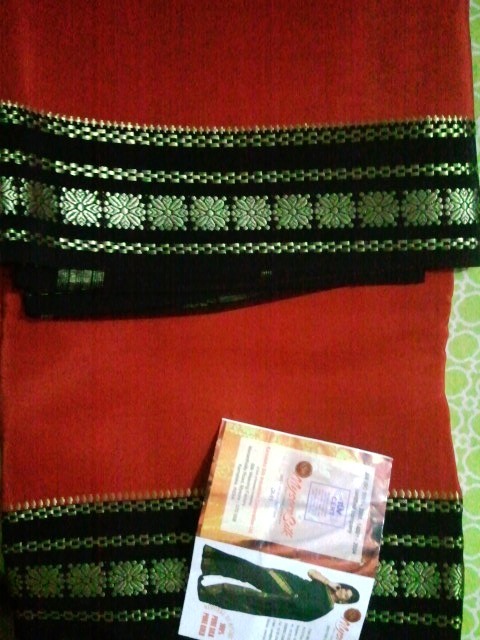 but that saree is super awesome… red and black – my fav combination! yeah I know! Too much na.. 😦 😦 I was feeling so guilty, later!